We eat a lot of sandwiches at our house. Pretty much every lunch during the week is sandwiches, and sometimes we have them for dinner as well! One of my favorite dinner sandwiches is a Greek Pita Pocket, so I was very excited to see it in my friend Susan Russo’s new book, The Encyclopedia of Sandwiches. 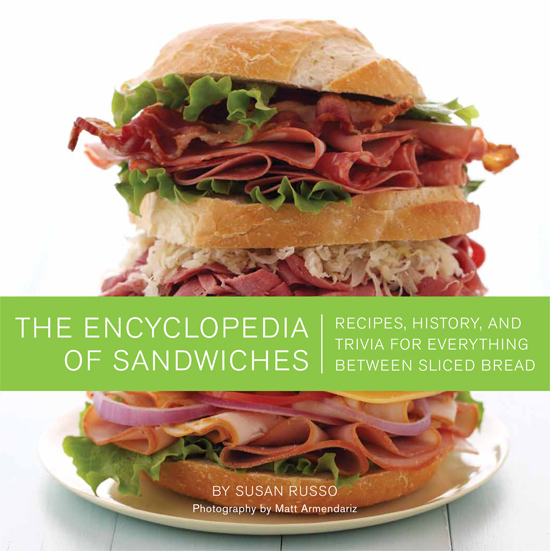 If you’re a sandwich person like we are, you NEED this book. My sister is already begging to borrow my copy! Susan (of FoodBlogga) knew what she was doing when she named this book. It’s not really a cookbook, though it contains a ton of great recipes. It’s the kind of book I like to read in bed; great stories about food. With every sandwich she brings a blend of history with humor, and hunger! The photography, by my dear friend Matt Armendariz, somehow captures both the simplicity and the beauty of each individual sandwich. 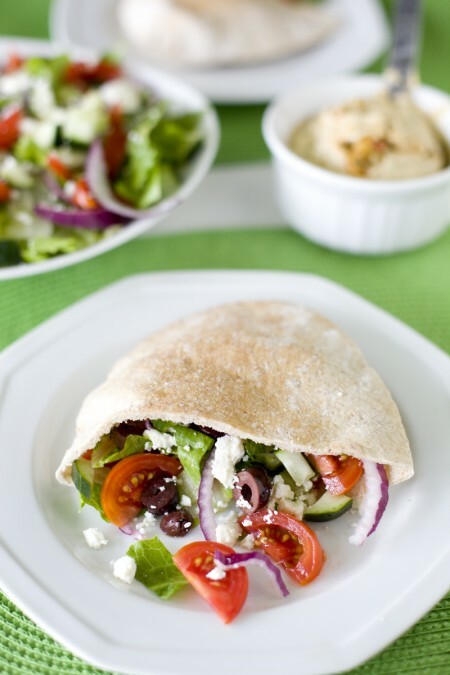 For the Greek Salad Pocket Recipe below, I adapted things slightly to suit our tastes and needs. With two college boys to feed, who often decide to work out at the school gym instead of eating lunch, dinner needs to be very filling. Susan says you can add lamb, chicken or beef to make the sandwich more filling. Once a month I’ll chop up a few chicken breasts, cook them in a skillet and freeze them in portions. They come in handy when I don’t have much time for making dinner. I thawed some of that chicken out to add to the salad. You’ll notice the cook time below says 0-10 minutes, there was no cook time for me, but there will be a little if you don’t use pre-cooked chicken. The great thing is, you don’t even need to season the chicken, the salad and salad dressing have plenty of flavor. Just chop it into small pieces and cook for a few minutes in a skillet with a little bit of coconut oil. You can put the cooked chicken in the freezer for a few minutes to cool while preparing the rest of the salad. For hummus, you can buy it in the store, or use my easy hummus recipe. Susan also gives a recipe in her book. Lastly, I adjusted the salad dressing slightly with salt and sugar. It’s my favorite Greek Salad Dressing Recipe that I got from a Greek restaurant in Hawaii! So, ‘fess up. What’s your favorite sandwich? 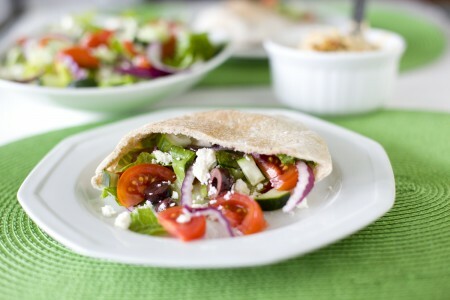 In a large bowl, combine lettuce, cucumber, tomatoes, olives, onion, feta and chicken by gently tossing. In a small bowl, whisk together olive oil, vinegar, lemon juice, oregano, basil, sugar, salt and pepper. Pour on salad and toss to coat. Spread some hummus in each pita half and fill with salad. Serve at room temperature. Approximate cost/serving: When buying kalamata olives, if your local store has an olive bar, make sure you figure out the cost per ounce and compare it to the jarred variety. I am often able to find it cheaper in a jar. I usually buy the store brand of whole wheat pita. The vegetables and feta are all cheapest at Sam’s Club for me unless it’s the time of year I can grow them myself. This cost me $6 for the salad (with chicken) and another $2 for the pita. So at $8 total and 4 servings it’s $2 a serving. Perhaps pricier than some of the recipes I share, but remember that it’s your main dish, salad and carb all rolled into one so it’s $2 per person for the whole meal. Vegetarian/Gluten Free: Just skip the chicken to make it vegetarian. For gluten free, make sure to use gluten free pita. I’ve seen gluten free pitas sold online that are really expensive. I’d suggest making your own gluten free pita. The recipe says it serves 8. How can 1 chicken breast feed 8? I have one 23 year old son and one would barely feed him and definitely wouldn’t fill him up and he isn’t heavy, but works out a lot and has a very, very physical job. Just curious how you feed you, husband and two boys? Great question Tonja, one serving is one pita pocket sandwich but that doesn’t mean one serving is enough for everyone. I had one pita pocket, my husband and one of the boys had two, our other boy who works out a ton had three, and we had some leftover salad at the end of the night. The key is that the hummus and feta are additional protein to make it more filling. Our exchange student who had three also put double the hummus in his sandwich. You can feel free to add additional chicken for your son, hope that helps!